I love tablescapes! Tablescapes define the style and mood of a wedding and reception. They can be extravagant and opulent like the one above, or understated and elegant. No matter your style or budget, you can create a tablescape reflective of your vision for your wedding day with a few fab finds and some ingenuity. Keep in mind, building a tablescape is all about layers. It may seem overwhelming when you look at a tablescape that inspires you... all the pieces that have to come together, all the little details...aaaggghhh! But fear not, here is a list of layers and some fab places to find steals and deals to create the perfect table for your special day! Depending on your inspiration table, you may have to forgo the linens provided by your venue (usually matte white or cream) and find something with a bit more interest. 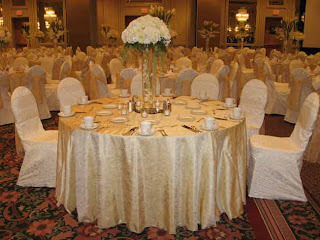 The table scape shown above wouldn't have had nearly he wow-factor without those fabulous embroidered gold tablecloths. Don't forget the napkins and chargers or placemats. You can easily swap out the damask charger plates for pretty patterned paper (same effect but way easier on the wallet). 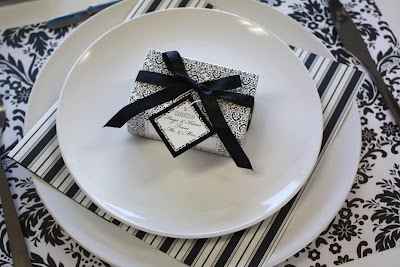 The menu is cardstock, and great favor boxes can be found at Good Things: Wedding Favors. 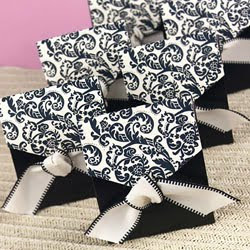 Be sure to check out Beau Coup Weddings for their perfectly adorable favor bags (they're only $.64 a piece)! Personally, I think chair covers are a waste of money and kind of visually distracting. Most reception venues have bamboo styled white folding chairs. They are not distracting and really, do you want the chairs to be as gussied-up as your bridesmaids? This is often the scariest part since it can cost hundreds of dollars and can be quite complex. Large over-the-top arrangements are certainly dramatic and have a major get major points in the first impression department. However, they are not very functional in an intimate setting such as a wedding reception. There is nothing worse than having a giant obstruction annoying the crap out of you as you crane our neck to see what's going on across the table, or at the wedding party table. If you go tall, go tall and unintrusive like this centerpiece that allows for unobstructed views of the entire reception. An alternative is to do a collection of short bouquets, or one full short bouquet of roses (my personal fav). You can dress up the table with candles, little candle lamps, or even small shallow vases that can accommodate a single floating flower or candle at each place setting. Small vases can be purchased for next to nothing. Save-on-Crafts has a variety of smaller vases for under $5.00 a piece, and Goa Wedding directory should be your one-stop-shop for fabulous flowers at unbelievably low prices. 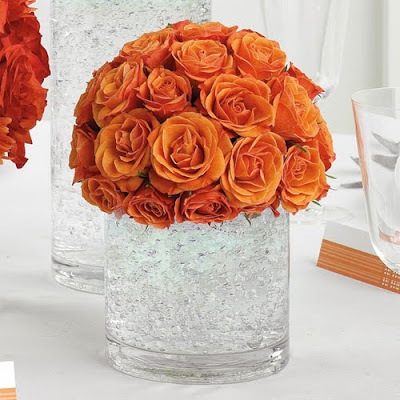 I have used them before and their roses are fabulous (you can get 200 for under $150)! A good full rose bouquet like the one above will take about 25 to 30 roses, so for about $30 a table you can have a uber-luxe looking centerpiece for way cheaper than a florist (the one above is $89.99 not including delivery). Now pat yourself on the back for being so ingenious! We're talking place card holders, table number holders, candle holders, holder holders... you get the idea. This is where you can really lose control of your budget. Look on ebay for tea lights and candle holders. I found a listing for 72 votive candles and glass holders for $49.97! Not too shabby. 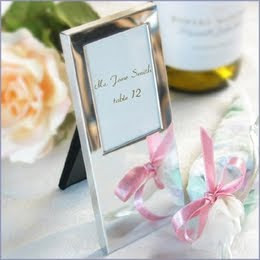 Don't want to send money on place card holders (which you will never use again, and your guests will throw away)? Dress up a standard tent-style place card by dipping the bottom front 1/4" with glue and then dipping in seed beads. Color code the beads to indicate meal choice to the catering staff. Adorable, and cheap, cheap, cheap!